Do you feel like you are losing your mind trying to choose the RIGHT stroller for your baby? You are not alone. I felt the same way when I was trying to decide what stroller to get. There hundreds of different strollers to choose from which makes the whole process a daunting task. It’s like buying the first car for your baby! Speaking of cars, it took me more time to pick a stroller than my SUV. I didn’t want to be stuck with a crappy stroller for 3 years wishing I spent more time on the research. For some reason, I was not as concerned when buying a car… nope. The SUV was dark blue … and I like dark blue, so I got it. With strollers I got completely OBSESSED! I was absolutely determined to find THE BEST STROLLER. So, I tested different strollers, read endless reviews and watched many many youtube videos before finally making my decision. Took me 3 MONTHS! My husband thought that I am crazy especially when he saw ten stroller in the living room. While I did my research I couldn’t find one single site that has a good comparison chart and a comprehensive buying guide to help me through the process. That’s why I decided to put one together for you. Let me begin by saying that most parents have more than one stroller. So, if you are trying (like I was) to find a stroller that HAS IT ALL including all-terrain wheels, deep recline, reversible seat, huge canopy, adjustable foot-rest, one-hand compact fold, lightweight at around 17 lbs, large basket because of course you are planning to do grocery shopping with it, and a price under $250, it’s IMPOSSIBLE! You will have to scarifies something. Some strollers are heavy and bulky, but have large air filled tires that will go through any terrain. Others are light and compact, great for traveling and running errands, but don’t handle terrain that well. Look, I am not saying you HAVE to have two or three strollers. You can have only one, but it’s probably not going to be perfect in every situation. Now, since different parents live different lifestyle and in different locations, they will need different strollers. Therefore, asking a parent for recommendation can be pointless. Just because this person has kids, doesn’t mean the stroller she recommends you will be right for you and your child. Everybody has a different budget and different preferences. That being said, I would recommend choosing a stroller depending on YOUR lifestyle, the most important features for YOUR family, and YOUR budget. Exactly in this order. To make it super easy for you, since we are all very busy and have no time to waste, I broke this guide into 5 quick steps. Step 1: In this step we will look at 7 most popular stroller types so you can get an idea what’s out there. Step 2: Next, we will go over some important features for birth – 6 months and from 6 months – 3 years. This will help you understand what you need at what age. Step 3: This is probably the most important step where we look at how your lifestyle effects your stroller selection. To make it even easier for you, I will also give you my stroller recommendations for each lifestyle for 2017-2018. I do update these strollers on a regular basis as the new models come out. Step 4: A few words about child safety and what safety features are important in the stroller. Step 5: If you still can’t decide, there is a simple option. Also, I will tell you what stroller and car seat I would buy right now if I only could pick one! This is the most popular type of stroller that come in all shapes and sizes. These full-featured strollers are designed to provide your baby with as much comfort as possible while also making it easier for you to get around. They include roomy seats, large sun shades (also called canopy), deep recline, storage area below the seat, and good size wheels. Most of them have travel system capability meaning you can convert them into a travel system for the first 6 months by using an infant car seat adapter. The weight of the stroller ranges anywhere from 16 – 32 lbs. Some have a reversible seat where the baby can face the parent or the world. A few have a pram option where you can convert it into a pram by replacing the seat with a bassinet. The price ranges anywhere from $100 up to $1,000. While many strollers can be turned into a travel system some come already with a matching infant car seat. The beauty of a travel system is that the infant car seat easily snaps right into the stroller without any adapters. It’s especially convenient when you have a sleeping baby and you need to transport him from the car into the stroller or from a stroller into your house. And as we all know, you don’t want to wake up that sleeping baby. LOL. The travel systems are budget friendly and very often come with a lot of accessories like parent organizer, cup holder, and a child’s snack tray, which is great comparing to a lot of luxury stroller that make you buy everything separately. This is a very popular option because of the affordable price. If you go to BabiesRus or Target, you will see a tons of travel systems. Why? Well, because for only $250 you can get a stroller and an infant car seat. While it’s pretty hard to beat price wise, don’t expect to get a high quality. Most parents regret buying it, because after the baby has outgrown her infant car seat, they are stuck with a bulky heavy stroller that has crappy wheels. And by heavy I mean anywhere from 26 – 32 lbs. It will be very tough to travel with and the long walks will be a not be that smooth. The Britax B-Agile Travel system on the picture above is one of the few travel systems that I recommend getting. The car seat is great and the stroller weighs only 16 lbs! The car seat frames is a lightweight option that is designed to carry only the infant car seat. It’s kind of like a travel system only without the main seat. You can easily snap the car seat right into the frame which is great for transporting a sleeping baby. It’s also very compact and is easy to throw into the trunk. Frames are becoming more and more popular specially among those parents who live in the city. The downside is that you can only use it while your child is using an infant car seat (about 12 months). After that, you will need to buy a stroller. If by the end of this guide you still can’t make a decision, just get a car seat with a frame. This will give you plenty of time to decide on the stroller. Traditional prams is a stylish way of taking your newborn for a stroll. You can use it for the first 6 months while your baby can’t move around and requires a flat surface for sleeping. As soon as you baby becomes active, it’s not safe anymore because the bassinet is shallow and doesn’t have a safety harness. Keep in mind, pram is really a luxury that you will use ONLY for the first few months. From a practical point of view, an infant car seat is a better option because it will last you for a whole year instead of just a few months. Also, it’s much easier to transition your baby from the car into the stroller/frame and eliminates the extra piece of baby gear you will need to take with you. And let me tell you, you will need all the room in your trunk you can get! Sometimes, after loading the car for 30 min with baby stuff, I have a feeling like I packed half of my house. And guess what? I always forget something. LOL. Something to drink, something to eat, a diaper bag, change of clothes, book for the road (if we are going to the park or a store), and etc. God forbid I forget that book! My little angel might get bored and start screaming all the way to the park. On the bright side, you will get to your destination much faster than you ever imagined. Anyways, if you are on a tight budget, I would definitely skip it. Now, if you are into prams and have the money, I would go for it. I know it’s not practical, but time flies so fast, and before you know it your baby will not be a newborn anymore. I didn’t get the stroller with a bassinet option and now regret it. Spend the first 6 months strolling in style! You deserve it! Lightweight strollers are light and compact making them great for traveling. They weigh anywhere from 8 to 16 lbs. Take it to a mall, doctor’s office, or restaurant, they are easy to navigate in any narrow or tight space. Surprisingly, the first year after my daughter was born I spend a LOT of time at the doctor’s office. I mean it was always something… Check ups, acid reflex, ear infections, cold, rash, and etc… I feel like I was at the doctor at least once every two weeks. Thank God for my full coverage health insurance! And the funny thing is that kids never appear sick when they are at the doctors office. By looking at smiling Sophia with rosy cheeks you wouldn’t know that she was coughing her guts out all night long like as if she’d been smoking for 20 years. I was ready to go an emergency that morning and was very happy that our pediatrician was able to fit her in. Of course he looked at me like I was crazy because the child was obviously fine and while smiling probably made note to himself: “FYI Insane Mom With A Wild Imagination”. Back to the strollers, since the waiting rooms and check up rooms are very small, I was glad I had a lighter smaller stroller instead of my wide bulky jogger. Aside from traveling and doctor’s offices, umbrella strollers are great from wheeling out your screaming toddler from a playground or the mall. You can just strap them into the seat using that padded 5-point harness and get them to the parking lot as fast as you can where you can safely re-strap her/him into the car seat and close the door of the car while taking a deep breath and prepare yourself for a fun ride home with a screaming child. Anyways, lightweight strollers are mostly used for kids older than 6 months because of the limited features. Most of them don’t have a travel system capability and aren’t very adjustable. The small wheels make it harder to go over rough terrain. Many come with a small sun shade and don’t have a full recline (or don’t recline at all). There are also so called “umbrella” strollers that have a very compact fold and can be carried over the shoulder. The downside of the umbrella model is a tiny hard to access basket underneath the seat. Because of the limited features umbrella stroller cost much less. The price ranges anywhere from $50 to $200. I’ve seen some that cost $20, but they look like they are made for dolls, so I wouldn’t risk putting my child into them. If you like to go for a jog, get a jogging stroller. These strollers three large three bicycle wheels with air-filled tires that will go through any kind of terrain. The built-in suspension will provide your little one with a smooth ride. Joggers have a higher weight limit than your standard stroller since you might want to use it for longer than 3 years till your child can keep up with you. Also, most of them offer travel system capability meaning you can use them with an infant car seat. While great for long walks, runs, and even hiking the trails, they are usually very bulky, heavy, and hard to maneuver in a tight space. It is also not recommended to jog with a child younger than 8 months. Having twins or a second child? Than you will need a double stroller. Double strollers are of course more expensive and much heavier than a single stroller. There are two options: tandem and side-by-side. Each option has it’s benefits and drawbacks. The side-by-side option has two equal comfortable seats next to each other where both kids can be any age. You can even put an infant car seat into one seat. While side-by-side model is much easier when it comes to getting over the curb or going down the hill, it is harder to get through the doorway, narrow store aisles, between the cars on the parking lot, or down the crowded sidewalk. That’s where the tandem model wins because it’s much more narrow and is easier to navigate in a tight space. In tandem stroller the seats are located one behind another. Some models even have reversible and removable seats so your children can face you or each other. The drawback is that a lot of times the second seat is smaller, doesn’t have the same features as the main one, and has lower weight limit. There are also so called “sit and stand tandem” strollers with the main seat is for a younger child and a seat with a platform behind the main seat where the older sibling can sit or stand. These models are getting more and more popular specially in an urban environment where parents used to run a lot of errands around town. I suggest to think about these two periods separately because your child has different needs. Convenience. If you are a first time parent, you probably can’t even imagine how important it is not to wake up a sleeping baby. Those moments are precious! While he is sleeping, you can finally brush your teeth, eat something, take a shower, or more importantly go to the bathroom by YOURSELF. LOL. Transferring a baby from a stroller into a car, or from the car into the house is super easy if your child is in a car seat. Safety. 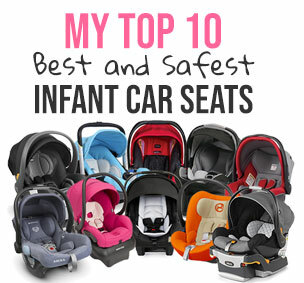 Car seat provides your baby with maximum support and comfort. It’s the most safe way of transporting your child. 6 months – 3 years. That’s when your child becomes very active, wants to see everything and touch everything. The 5 point harness is essential to keeping the child in his seat. Once your child starts walking, he will have so much energy you will go crazy staying at home. Going to the playgrounds, parks, and long walks on the daily basis will be the only way to get your child tired enough to take a nap. Your stroller will become your base camp full of snacks, drinks, change of clothes, towels if you are going to the pool and other crap you need to take with you when you are away from home for 3-4 hours. You will need ample of storage and larger wheels to get through broad range of terrain. Surprisingly, your lifestyle can have a big impact on your stroller selection. Do you like to spend a lot of time outdoors? Do you live in a small apartment with limited space? Do you use public transit? Are you planning on traveling half of the world with the baby (I know those parents)? Or maybe you are a cool sporty parent who want to jog, walk trails, and hiking? Or maybe super stylish and fashionable who want to show off by getting the most expensive stroller? Or maybe relaxed parents who go with the flow and don’t stress things too much? Or maybe practical parents who are preparing for a second child? I was thinking of myself as a stylish sporty parent who will spend a lot of time outdoors jogging at the park. Like one of those cool fit moms you see in the park jogging with a double strollers while their adorable kids quietly enjoy the ride. So I ended up getting Bumbleride Indie at first and a lot of other strollers later. Well, not much of the jogging has been going on really. LOL. More walking around neighborhood, shopping or running errands. Keep in mind, that a lot depends on your child. With my daughter Sophia, it’s hard to find the time when she would just be quite and enjoy the ride. She gets upset very easily. Also, I like to take a shower after jogging and it’s a little challenging with a toddler who has separation anxiety and gets into stuff. That being said I rarely jog with a stroller, but I do like to go to different parks so all-terrain wheels have been great. Anyways, for each lifestyle I would recommend different kind of stroller. The biggest difference is probably in the wheels. The lighter and more compact the stroller is, the smaller the wheels. Wheels is the most important feature in the stroller that can move it from one category to another. Here is a list of lifestyles plus my stroller recommendations for 2017-2018. In the city many parents live in small apartments, use public transit, and run errands around town by foot. They rarely use a car, many don’t have one. In some buildings there is no elevator so they have to use stairs to go up and down. Many walk to the park from their apartment building. They want to have one lightweight compact stroller that has plenty of storage and can be easily folded with one hand. At the same time it needs to be durable with decent wheels for different types of terrain. The most important features in the stroller would be light weight (no more than 20 lbs), compact one-hand fold, narrow frame for easy navigation, nice size basket to fit all the groceries, and good size wheels. Most parents get around in a car. I personally live in suburbs and own an SUV. So, the size and the weight of the stroller is a lesser issue for me. I use my car to get to the park or a grocery store so I don’t need to do shopping with my stroller. Just like most suburban parents I only need two strollers: a full-featured one that turns into a travel system for going to the park, and a lightweight umbrella one for running errands and traveling. Since the size doesn’t matter, as your main stroller you can get a larger one with more features like good size wheels, reversible seat, large basket and a heavier weight (around 23-25 lbs). The fold has to be easy, but doesn’t need to be one-hand since you probably wouldn’t need to hold a stroller and a baby at the same time. Below I have a great selection of reversible seat strollers that are suburban favorites. You love sport and no baby going to stop you. LOL. If you are one of those cool sporty parents who like to stay in shape no matter what (and make the rest of us look bad), then you can’t go wrong with a jogger. Joggers have large air-filled tires and can handle any type of terrain while providing your child with a smooth comfortable ride. Most of them have larger roomier seat with higher weight limit that can accommodate an older child. This comes very handy since even an older toddler (4-year old) wouldn’t be able to keep up with you. So, the most important features are: the air-filled wheels, suspension system (you will need it for a smoother ride), large canopy (since you can’t reverse the seat to hide from the sun), adjustable handle bar, roomy seat, and one-step brake. With all these great features the joggers tend to weigh more (around 25-28 lbs) and have bulkier fold than your regular full size buggy. If you like to spend a lot of time outdoors going for long walks at the park, trail walking, or just going to playgrounds, you need an all-terrain stroller with larger wheels. They don’t need to be as large as on a jogger, and don’t have to be air-filled, but should be large enough to handle different types of terrain. Of course air-filled tires have the best natural suspension even without added suspension so they will provide your child with the smoothest ride, but there are also some new models that have foam filled wheels very close to air-filled. The most important features would be all-terrain wheels, roomy seat, large canopy, suspension system, and one-step brake. These babies range around 21-27 lbs. Some parents just can’t stay in one place for long. They like to be outdoors a lot and travel to different places or even countries. They need a lightweight stroller that has a compact fold and can be easily carried around. Most of the time it would be a light umbrella stroller with smaller wheels, but lighter weight (around 14-17 lbs). Some of them can take an infant car seat, others can’t. Features to look for are: light weight, compact fold, travel system option, deep recline, nice padding on the seat, and large canopy. Most of these models don’t have an adjustable handle bar or large basket. If you haven’t had the first child yet, but already thinking about the second (I should tell you to stop and wait till you have the first one because then you might reconsider. LOL. Just kidding. They are a joy of our lives), I can recommend you a single stroller that can convert into a double when you have a second child. How cool is that? Typically convertible strollers have larger wheels and heavier frame that can handle two seats. Of course this increases the weight and the bulkiness of the stroller. The average weight of the convertible stroller is around 28-32 lbs. I wouldn’t recommend getting it for just one child. The features you need to look for in the convertible stroller are: larger wheels, large basket, seating options, deep recline, and adjustable handle bar. If you one of those parents who just wants to make a fashion statement with the stroller, there are a few very stylish buggies I can recommend. I want to remind you that although this strollers are luxury and stylish, they not always very practical. I can compare them to a high heels that you love to wear, but can’t get very far. They are like piece of art! That’s probably not going to be your ONLY stroller. 5 point harness. Use it! It’s important to retrain your child with a safety harness. These days all strollers have a 5 point harness with a center release or side release buckle. Some of them are padded others are not. Most of them are adjustable. I don’t use shoulder straps anymore because my daughter is older now and doesn’t like them, but I always buckle her up by using waist straps. Folding. Folding mechanisms can also be dangerous. There are some reports (not a lot) of kids getting their fingertips amputated by a folding stroller. Scary… Don’t fold the stroller with your baby in it! Make sure your child is away from the stroller before folding it. Parking brakes. Check the parking brakes to make sure they are fully set before letting go of the stroller. Check for recalls. There are many recalls happen every day. Make sure your stroller or car seat is not one of them. You can get the info on the Consumer Products Safety Commission website. Jogging. Don’t attempt to jog with a stroller unless it’s designed for jogging. Not all three-wheel strollers are joggers. Joggers have three large air-filled tires that can handle many types of terrain. One of the most confusing companies is Baby Jogger who makes three wheel strollers that are NOT joggers. I see people in the park jogging with a low budget travel system! Crazy! All I want to say is STOP before you lose control and brake your leg or worse, hurt your child! Also, don’t jog unless your child is 8 months old. Does that sound like you? Ok. Take a deep breath. Stroller shopping is not the end of the world, although sometimes it might feel like it. If you still not sure what stroller you need, I recommend getting a stroller frame for your infant car seat. Frames are very light weight, compact, often include parent console, and usually have a large basket for storage. You can use it for the first 6 months while you are still testing strollers and trying to figure out why your life have changed so much… you thought you are going to take your baby everywhere with you and now you are sitting at home tired with a crying baby wishing you could take a nap. Then, after 6 months, buy a stroller you think will work best for your adjusted lifestyle. Just pick a frame that works with your infant car seat for now. It is the most convenient option for the first 6 months anyways. Infant Car Seat Option: I would recommend getting Chicco Keyfit 30 infant car seat because it’s one of the most popular and safe car seats on the market. It has one of the best reviews on Amazon and works with most strollers. My daughter absolutely loved it! She always fell asleep in the car. You can purchase it for $189 on Amazon. Frame Option: Chicco KeyFit Caddy Stroller Frame is specially designed to work with Chicco Keyfit 30 car seat. It features light aluminum frame, compact one-hand fold, large expandable basket, 4-position height-adjustable handle, all-wheel suspension, toe-tap locking brakes and a full-featured parent tray. It weighs only 11 lbs and costs only $99. You can’t beat that! I know that stroller buying is hard, so feel free to post your questions or comments in the comment box below. I will try to answer it as soon as I can. I can’t decide between Mamas and Papas Armadillo Flip or Peg Perego Book Pop Up. :( If only Flip has a bumper bar then it’ll be perfect! I’m one of those FTM’s who wants her stroller to have it all. I don’t need it to be car seat compatible, as I bought a basic stroller frame to use while deciding what I need next. I live in a suburb and will probably use the stroller for errands and walks around the neighborhood and the park. However, I’m a small person with a small house and a small car, so I need it to be relatively lightweight and compact. I don’t need a parent or child tray, though a decent storage basket and a place to stash keys and a water bottle would be good. I really want a single handle as opposed to umbrella handles. I’d pretty much settled on the Joovy Scooter, and now they’re all out of stock online. I love the looks of the Qool, but I just can’t spend that kind of money on a stroller. I’m hoping to find something in the $200 ranger (or under). I don’t want it to feel cheap. I looked at a Kohlcraft at Walmart and it just felt flimsy. Hi Susan, I also can’t decide between Peg Book Pop Up and Armadillo Flip! Can you explain why you think Flip is better? Pop Up seems to have more luxury features. Sara, I ended up buying both but decided to keep the Pop Up and I’m happy with it so far. The bumper bar is definitely a must for my baby and the seat is one of the most upright I’ve seen (my baby likes to sit very straight sometimes). Another thing that makes me pick Pop up is the seat material. It just more durable and much easier to clean. Some people mentioned FLip’s front wheels get stuck when unfolding the stroller, which is true but not all the time. One thing I miss about Flip is the sleek and lightness. So far my husband has been the one folding and unfolding the stroller to/from the trunk majority of the time, but when I have to do it, I find it heavy and bulky. :( If your baby doesn’t have a problem with sitting in slightly reclined position and bumper bar is not a must then I suggest getting the Flip and get the seat cover. I have to warn you that Pop up doesnt fold like a book when the seat is parent-facing, while FLip does. I hope this helps.. Thanks so much Jessica! That definitely helps me compare the 2. Can I pick your brain a little more? This would be for a newborn (my 1st, due in May!) so the bumper bar and seat uprightness aren’t issues (yet ;)) – so considering that would you recommend the Flip instead of Pop Up? What about the Pop Up’s bassinet feature- is it as awesome as it looks? I haven’t had a chance to check out the Pop Up in person but I tried folding the Flip and I found it to be a little awkward/ not as smooth as I had hoped- is this just a matter of practice or did you find the same? Thank you so so much for your input!! I started using Pop Up when baby was 5 mo so I cannot comment on the bassinet much except that it’s decent size, well built and I wish I bought it sooner so my baby gets to use it. The steps to fold both stroller are basically the same and you will get used to it. I did find the auto lock on Flip often fail to engage unless I pull the carry handle harder (also something that you will get used to). More important point, I think, is how the stroller unfolds. Pop up, because it pops, hands-down is much easier. I don’t have to shake it. Not sure if this matters but I have the pop up and I think my baby hates it!! (She is almost 10 months old) I found the leg rest on the pop up doesn’t go perpendicular enough. What I mean is that she can’t fully stretch out. My LO seems to like stretching out her legs but with the pop up, her legs just kinda hang out. Other strollers like the Vista and the armadillo have way more leg rest positions which can make the recline position more comfortable . I now want the armadillo but I can’t seem to find it in Canada! Picking a stroller is such a struggle. I’m a first-time mom, and want a stroller our baby can grow into. I see us using it for walks, going to the park (maybe beach), the store and on trips to visit family in another state. With all the putting it in and out of the car, I want something light and easy to fold, with decent storage. I’m torn between BOB Motion and the Mama and Papa Armadillo, but now seeing some new Umbrella-like strollers that can also be travel systems , and I feel like I am widening the field to more than just two–once again. We don’t want to spend much more than $300 on the stroller (not counting car seat adapters if needed). Help!!!! Should I go wih motion or armadillo, or is something newer a better bet? 2. Armadillo Flip XT (mamas and papas – glad to see your raving review on that one) – I’m fine without a bumper bar but I noticed that the main added value of that bar is to lift the stroller on stairs. Seems to be the only value – thoughts? 3. Babyjogger City Mini GT – main concern is that the drawstring reclining bit will be a nuisance for long legs. We tried in the store and it seemed ok but not sure if it would be an issue with a real child? Thanks a lot! Leaning towards Armadillo at the moment FYI because it’s so flexible. I really want a stroller recommendation. I am very much a suburban mom. I have two older children (7 & 11) and am so out of the loop. I know I want a seat that faces front and back, car seat compatible, large basket, nice tires (that will work for shopping or strolling on sidewalks/paved trails), good recline (not with straps), easy fold (nice if I can roll it while folded), adjustable handlebar, and preferably with some sort of bar for both child and organizers for parents (cup holders and such). I can’t think of everything! I drive a van and have room to stow it. I’m just so overwhelmed by the endless options available now. I don’t want to make a big investment and end end up not liking my purchase. Also, I really don’t want to spend in the uppababy vista range if I don’t have to. Hi Susan, I’m going bonkers trying to figure out which stroller to get!!!! I’m a very practical person and a first time mom, and I would love to get just one stroller that does it all. I do a ton of urban walking (and some hiking) and am looking for a stroller that can be closed with one hand, is lightweight (25 lbs or less), compact (city apartments! ), is reversible, can be used from birth to a 35+ lbs, can be used with a bassinet (or sleep bag), and can also be used with a car seat. I’ve been thinking about the Armadillo Flip XT and the Stokke V2. Should I be considering any others? If a stroller has all of the above, price wouldn’t be an issue, but I also wonder if I’m just asking for too much!! Thanks, Susan! The Baby Jogger City Mini GT looks really great, but I think I’d really like to have the ability to reverse the seat during the first few months. The more and more I think about it, the more I’m inclined to go with the Armadillo Flip XT. Thanks for your help! Thanks so much for creating this site–so helpful! We are first time parents living in an apartment in Chicago. We do a ton of city walking and it snows so. much. here. Therefore, we are looking for a stroller that (a) works for running errands, (b) is good for walking long distances in the city, (c) has a car seat option, and (d) can easily be stored in our SUV or in the apartment. Handling snow is important to me as well–I already hate winter as it is. :) We’d like the stroller to go from infant to max age. I am trying to figure out which stroller to get. I am between mamas and papas armadillo flip XT and Sola 2 MTX. I know they are both kind of similar..that’s why it is hard to decide. I live in Miami, but planning to go to Europe for few months where I will walk a lot. Which one would you recommend. thank you. I am a SAHM and currently live in a city – I rarely use my car and take my 18 month old son everywhere in the stroller. I currently have the Uppababy Vista 2014, but as we are expecting #2 at the end of June 2016 I am researching a new stroller (my first will be just over 2 when baby arrives). We are planning to move to the suburbs in 2017. I am 5’2″ and average 110lbs so while I can fold and put the Vista into our trunk now, I am concerned about the weight and size of a double stroller. I loved using the bassinet option with the Vista but realize I may need to sacrifice that with #2. My son is on the taller and heavier side for his age group. I’ve been looking at the side by side strollers over the tandems because I feel like my son would be annoyed by his ‘view’ so to speak. I want an adjustable foot rest because to this day, I still find myself adjusting the foot rest. I also want a large visor and need the stroller to be manageable and on the lighter side for when the move to the suburbs happens. My son likes to sit straight up and even in the Vista he still sometimes leans forward. I was looking at the Valco Snap Duo because it seems to have so many features yet still remain lightweight and during our time left in the city, I can put the all terrain wheels on it. I think I can use it from birth as well? Any others you recommend or am I totally off in thinking a side by side is what I should get? Thanks! Hi Susan, this is the most helpful post amongst all I have read so far! Thank you for posting this! I’m a suburban FTM. I’ve done so many researches on strollers. But all posts I’ve read were mostly about the features not about the lifestyles. I was almost certain than I’d get UPPABABY Cruz(was debating between that and BRITAX B agile for $$ reason, but I think I like the Cruz too much) until I read your post. I barely have outdoor activities. I come home from work and get rest. I get more rest on weekends or visit friends sometimes. I cannot go anywhere without a car. I would probably use the stroller for going to the day care, doctors, friends house, and occasionally restaurants. That being said, I am kind of leaning towards getting a snap and go for the first 6mo. then getting a good umbrella stroller. I’m not sure if I would really need a regular stroller. I have a big house and planning on getting a van, so size of the stroller is not the problem. I don’t know how much more activities I would be having after the baby is born and also how much I would hate having a heavy stroller (if buying a standrard stroller) or not so sturdy stroller (if buying an umbrella stroller).. Any advise? Hi Susan, you seem to have a really great site here. I’m helping my daughter with choosing her first stroller – very exciting my first grandchild. I am hoping she will avoid the mistakes I made in picking my first stroller. We’ve narrowed it down so far to the Baby Jogger City Mini GT-4 wheel versus the M&P Armadillo Flip XT. We love the big basket of the Armadillo in comparison to the somewhat smaller on on the Baby Jogger and it does have a bigger canopy, but I was wondering what you think about the material that it is made from. Isn’t it slippery? I was thinking about that after I left the store and wanted to get some other opinions. What might be some other pros and cons of these two strollers? Susan, I cannot thank you enough for creating this site! As a first time mom living in NYC, the daunting task of choosing a stroller is so far one of the toughest (maybe right after choosing a name!). As you know, us city dwellers prefer an all-in-one system but my very narrow apartment hallway entrance makes a slim design super important. I was looking at the Nuna Tavo since it’s a great looking stroller and seems to functionally check all of the boxes according to your super helpful review. As this one came on to the market late in 2015 after your post above, how would you factor this model into your 2015 buying guide? 2) at first I thought a stroller seat that changed directions was a must, but now I’m reading that once baby has good head control, it’s fine for them to face out. If this is the case then it seems the lighter, slimmer strollers will be great!? THANK YOU AGAIN! I will be sharing this site with all of my pregnant FTM friends! Thank you for putting this together! I’m trying to decide what stroller I want but not finding one that has all of what I need/want. I’d love your thoughts! I’m looking for a stroller that: can fold with the seat on it, the seat can be used since birth (lies flat), one hand folding stroller, can have a car seat attached on top of the seat (prefer not to remove the seat) and flips. I’ve been looking at the Nuna and Mamas & Papas but neither have everything listed. What do you think might be best and why? I was drawn towards the bumbleride because it came with the car seat adapter and was a bit smaller, the basket is the full-width of the stroller and people have complained that the Bob seats can lean in towards the center. I just learned the 2016 Indie Twin does not come with the adapter and now I’m wondering if there is enough leg room once my babes get older. Hi Susan, I thought I had it all figured out…but now I’m feeling a little lost as I hadn’t taken height into the equation. I was originally set on the Britax Travel System as my main stroller/car seat combo….and also getting a Summer Infant 3d flip as a lightweight stroller to have on hand as well…but I just read something about taller people having trouble with a lot of strollers – the B Agile in particular. I know the B ready is a bit better with it’s adjustable handlebar…but I’m just not sure if I’m headed in the right direction now going with Britax or if I should be looking at another brand that’s better for short/tall couples to both use. I’m 5’2″ but my husband is 6’4″. Any suggestions you could provide would be greatly appreciated. I have a 6 month old who hates her car seat so we’re trying to find a good stroller. I already have a Bob which I love but would love a stroller to put in the back of my car for taking her with me to run errands around town and to airport travel with (so fairly light). I would love a reversible seat, compact one hand fold and a bumper bar. I’m looking at the Mixx2 vs Urbo2 and really torn. I know you recommended the Mixx2 in other posts but it’s about 10lbs heavier and I think that might be annoying while traveling? Or would you recommend going with the Mixx2 and then buying an umbrella stroller? Hey!! Just wondering what your thoughts are on the city mini double stroller? I’ve heard its a great stellar for travel – but wanted to get your take on it. We are planning a second baby – and our first is almost 2 now. I was told the Uppababy is an amazing stroller but I kind of like the strollers where the kids are side by side. We are hoping to get a stroller that we can easily travel with on airplanes, we can have in the back of the car and won’t be so crazy bulky, one thats easy to fold up, one that we can put the infant car seat in but also have our older child in as well and then when they are both older – one that they can both be in (if that makes sense) etc. I’ve read a lot of your recommendations on the different strollers but I guess I’m still a little unsure. I’m Just starting to research everything – but after having our first child I realize how much easier life can be when you have the right stroller !!!! Thanks so so much!! I really loved reading your reviews, they are very helpful for me….i will soon have my first baby and feel completely lost with so many options available for the stroller. I really like the design of Anex Baby – Sport, very stilish and fashionable, with a 3 in 1 system (stroller, pram and infant car seat) but i couldn’t find consistent reviews about it. Can you help? Thank you so much for helping us, it is really difficult to choose a stroller among so many options. My situation is a bit different. I’m from Brazil and I’m not preagnant yet. However, since I’m going to the US for vacation, I would like to buy my not-yet-conceived baby’s stroller. These itens are extremelly expensive in Brazil, that’s why I intent to buy it in advance. My knowledge about strollers is extremelly limited so I really appreciate all the help I can get. I am looking for something light weighted, easy to fold, and comfy. My lifestyle is city living and I cant go out without a car (public transportation doesnt work very well in here). I liked your choice: Nuna Mixx2 and Pipa car seat; but I dont know if I could take them at the airplane without getting my kidneys ripped off ($, just kidding). I also liked Diono Traverse; mamas & Papas Ocarro and Cybex Mios. Can you help me choosing one? I was wondering if you have input of the Baby Zen Yoyo stroller as not just a travel stroller, but also as a primary stroller for every day use.